The piece “Malawi conducts scrutiny on mines bill” featured below was initially published in Malawi’s Mining Review Issue Number 25, May 2015. A cross section of Malawians of different walks of life had an opportunity to scrutinize the New Mines and Minerals Bill and inject their input into the all important document at a national consultative workshop that was held in Lilongwe from April 14 to 15 with funding from the World Bank and European Union courtesy of the Mining Governance and Growth Support Project. The workshop was officially opened by the Minister of Natural Resources, Energy and Mining, Honourable Bright Msaka who stressed that the aim of the Malawi Government is to come up with a law that will promote sustainable mining in Malawi. There is no doubt in the opinion of Government that mining still remains one of the key priority sectors that can significantly contribute to socioeconomic development of the country. This is also envisioned in the current Malawi Growth and Development Strategy. However, in order for the mining industry and our mineral resources to make the expected contribution to the country’s economic growth, there is need for concerted, consistent and steadfast effort towards promotion of sustainable mining. This, in the main, will be possible only if we develop a sound and comprehensive mining legislation, which takes into account prevailing international best practices, attract investment and enables Malawians to derive optimum benefits from mining. The Minister also said he envisages a modern Mines and Minerals Bill to be one that adequately addresses corporate social responsibility, has in place a system for determining fair practices, enforces transparent and accountable decision making, encourages local equity participation, recognises the value of minerals exhibitions, protects investors from being hounded out of their investments, and does not ignore the role of women and the youth. Members of private mining companies who gave their views on the bill agreed with Msaka that besides addressing several other pertinent issues, the new law should protect investors from being hounded out of their investments. commented Eugene Khoriyo, Country Director for Malcoal Mining. He explained that the coal subsector is one of the major employers in the mining sector which makes it imperative for the government to protect it to ensure its survival. Cement producing companies also shared the same feelings with Shayona Cement and Cement Products Limited complaining of cheap imports invading the cement market. said Cement Products Limited Chairman Aslam Gaffar in an interview after the workshop. Chiefs also had their say on the bill with Paramount Chief Kyungu stressing that the government should include measures to ensure that mining companies fulfill the corporate social responsibility pledges they make to the communities when launching projects. The Paramount Chief also urged the government to incorporate measures that will allow communities have shares in the mining ventures taking place in their areas in order to ensure that the communities directly benefit from the projects. The point was backed by District Commissioner for Blantyre, Mr. Charles Kalemba ,who proposed that people whose land have been taken away for mining purposes must be allowed to use their land as a token to acquire shares in the projects. On their part, civil society representatives proposed that the bill, which has clauses to allow government hold up to 10% free equity in large scale mining ventures, should also make it mandatory for mining companies to give some shares to locals. In addition, they proposed that the government sets up a company to invest in joint venture arrangements with foreign mining investors. said Executive Director for Institute for Policy Interaction, Rafiq Hajat. Representatives of financial institutions also aired out their expectations at the event. They pointed out that provision for huge investments in corporate social responsibility projects as proposed by some delegates will make it difficult for mining companies to acquire project financing from banks. commented Mr. Mutisunge Banda of Standard Bank’s Investment Banking Department. Commissioner for Mines, Mr. Charles Kaphwiyo argued against giving more shares to locals in mining companies saying such a scenario would expose them to the risks of the industry as mining as a business is exposed to uncertainties on the world commodity markets. Mining Law Consultant Professor James Otto responded to the Civil Society concerns of lack of community engagement in the sector saying the new bill has adequate clauses on the issue. Professor Otto said he could not recommend the idea of forming a state-owned company to invest in mining as proposed by the members of the civil society because it failed in several countries. He also agreed with Kaphwiyo that despite ensuring that benefits from the mining sector trickle down to as many Malawians as possible, the bill has been drafted to ensure that Malawi has a competitive advantage in attracting investors since countries in the region and beyond are competing to attract investment. At the workshop, officials from the Ministry made presentations on what is contained in the bill and welcomed comments from members of the audience which, among others, included traditional leaders, district commissioners, religious leaders, members of parliament and civil society groups. 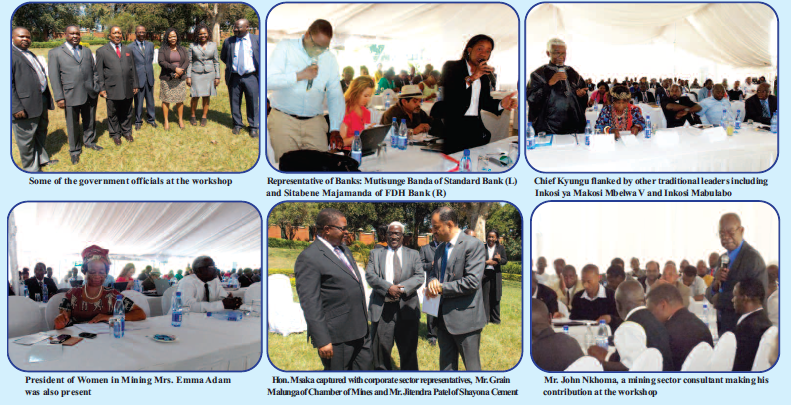 The gathering was a follow up to the National Consultative Symposium on the bill that was held at Bingu International Conference Centre from July 16 to 17, 2014. As opposed to the Mines and Minerals Act of 1981, which vests resource ownership on the President on behalf of the people of Malawi, the proposed law says the resources of Malawi are directly owned by the State. The seriousness of the delegates, their active participation and the richness of the contributions certainly showed that the decision by the Malawi Government to review the old mining laws and the contribution by the financiers World Bank and European Union are of great significance.